Formwork for concrete structures is more important in order to get perfect dimensions of structural parts. 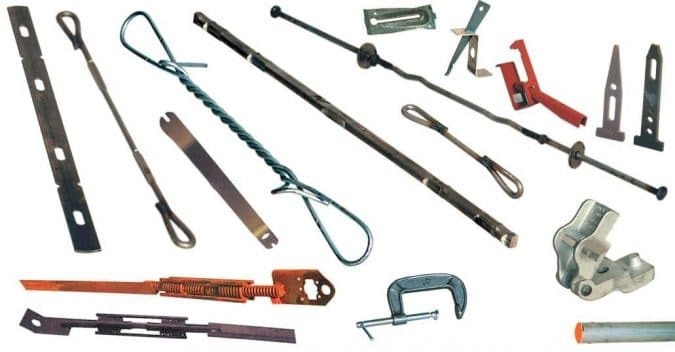 Accessories used in formwork will also play a key role in it. 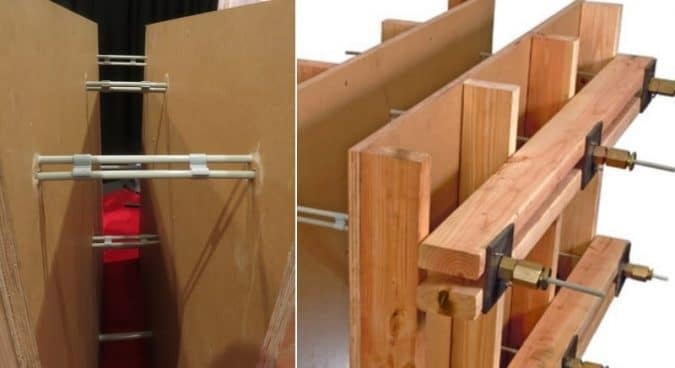 Form ties are the important accessories of formwork. Different type of form ties used in formwork are explained below. What is a Form Tie? A form tie is an accessory used in formwork, used to hold the concrete wall forms firmly against the lateral pressure of freshly placed plastic concrete. They maintain equal space between the forms which results in uniform thickness of walls. A form tie contains two parts namely internal tension member and external holding device. Removal of ties after complete hardening of concrete depends upon type of tie used. Some ties can be removable and some are not. Different types of form ties are explained below. Continuous Single Member type ties are called as one piece ties. In this type, the whole tie member is a single unit and for holding this when placed in forms, special holding devices are used. After hardening of concrete, some one piece ties can be completely removable, some are removed by breaking. Flat tie is a thin flat steel plate which contains hole at each end. These holes are used to lock the flat tie in forms using wedge and pin. These are preferred for prefabricated modular form panels and for light duty purposes. These are for one time purpose only since they cannot be removed from hardened concrete. They are removed by braking and to facilitate braking, a notch is provided at a predetermined distance from its ends. To prevent turning of tie while braking, holes may be provided in its middle portion. Loop tie is single metal bar which ends are looped to provide space for locking systems such as wedge and pin. These are also preferred for prefabricated modular form panels and for light duty purposes. Loop tie cannot be removable from hardened concrete hence, it contains weaker cross section. To prevent turning against braking, some part of the middle portion is crimped. Fiberglass ties are newly developed tie system which are made of glass fibers and resin materials. These are available in longer lengths and can be cut into required sizes easily. These ties are fixed to the form panels using gripper and tie wedge arrangement. After hardening of concrete, the ties can be cut at the surface level of hardened concrete. So, the hole will disappear. They are available in so many colors and capable of carrying higher loads than flat, loop and snap ties. Snap tie is a single rod which ends contain enlarged button or loop to facilitate the use of suitable tie holders. 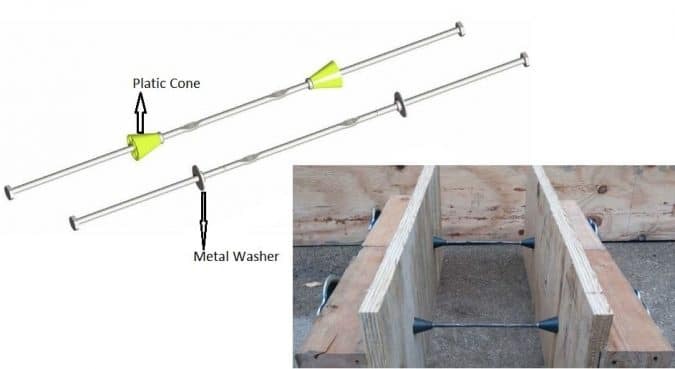 Plastic cones or metal washers or pins are attached to these ties to use them as form spreaders and also to prevent water leakage from concrete. Snap ties cannot be removed completely from the hardened concrete hence, they contain weaker cross sections which are easy to snap. The breaking of tie should be done after complete hardening of concrete otherwise they do not break and turn inside the wall by spanning the concrete. To prevent turning, while making these ties a portion of the tie at required distance is crimped or weakened to ease snapping of tie. Taper tie contains a tapered rod which is threaded at both ends. After placing in forms, these ends are locked by using wing nuts and washer system. They are available in standard lengths of 34 in to 60 in. So, required wall thickness can be obtained using different lengths of taper ties. The diameter of taper tie is gradually reduced from larger threaded end to small threaded end. Tapered ties can be removed completely after hardening of concrete and can be reusable. 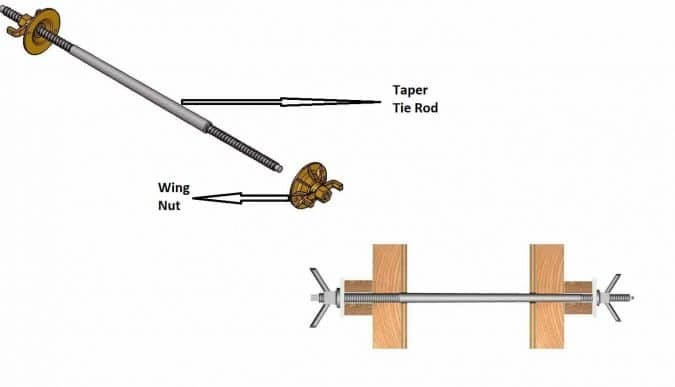 For easy removal, taper tie must be coasted with grease before installation. Threaded Tie contains a metal rod which is completely threaded from one end to the other end. It is fixed to the forms using nuts and washer on each end. It can be removed from hardened concrete if plastic sleeve is provided around it. After hardening, the sleeve is bonded with concrete and threaded tie can be removed and reused. It can be used for higher loads, but in such case two nuts on each end are preferred. In this type of ties, the tie member contain threaded ends so, the external members can be removed without any breaking or pulling. Internal disconnecting ties are classified into two types as follows. She-bolt tie system contains one inner tie rod and two she-bolt members. Both ends of inner tie rod are threaded up to some distance. She-bolt contains one normal threaded end and one tapered end with threaded hole. The taper end is placed internally into the forms and tie rod is screwed into the threaded holes of she-bolts on both sides. 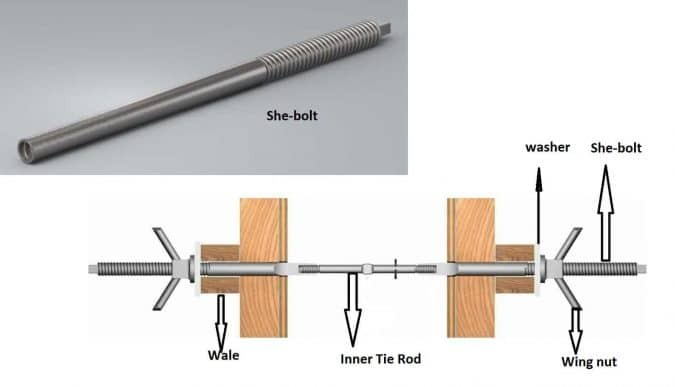 External threaded ends of she-bolts are used to secure the forms by wing nut and washer arrangement. After hardening of concrete, the inner tie rod remains in concrete and she-bolts can be removed and reused. 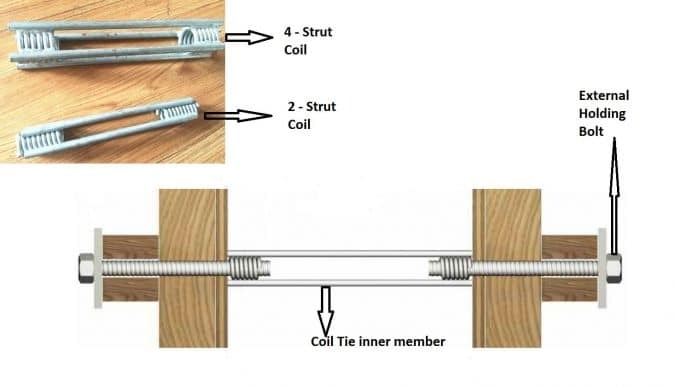 Coil tie contains two members, inner tension member and external holding member. Inner tension member consists of two helical coils welded to the ends of two or four steel struts. This member remains in concrete after hardening. External holding member consist of two bolts which are screwed into the coils on both ends and these bolts are supported by washer and wale arrangement. These bolts can be removed after hardening and reused. Two strut coil is used for medium works and four strut coil is used for heavy works. If required, plastic or wood cones can be provided at each end of the coil to act as form spreaders. 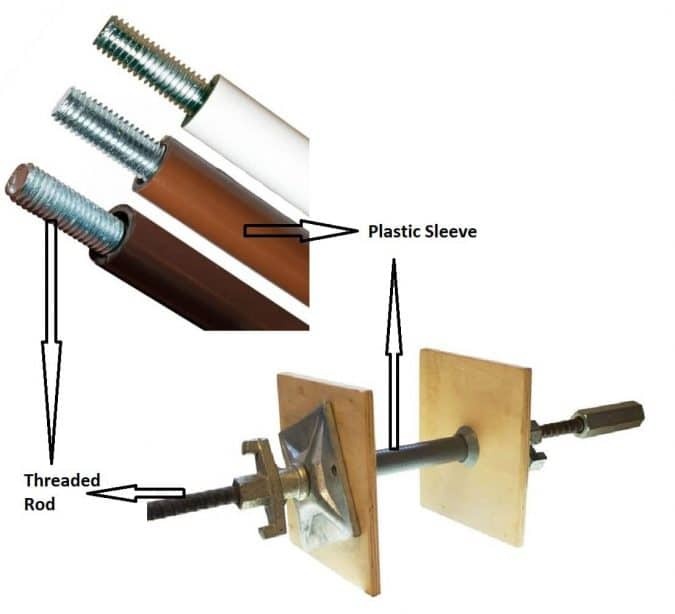 If the thickness of wall is too large, two inner members connected by threaded rod can be used. Safe load capacity range values for different types of form ties are tabulated below. 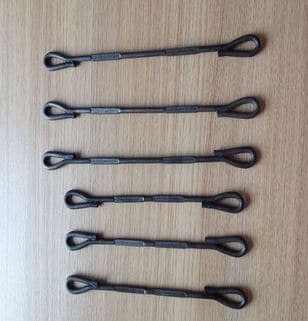 Which of the Following is Internal Disconnecting Type Form tie? 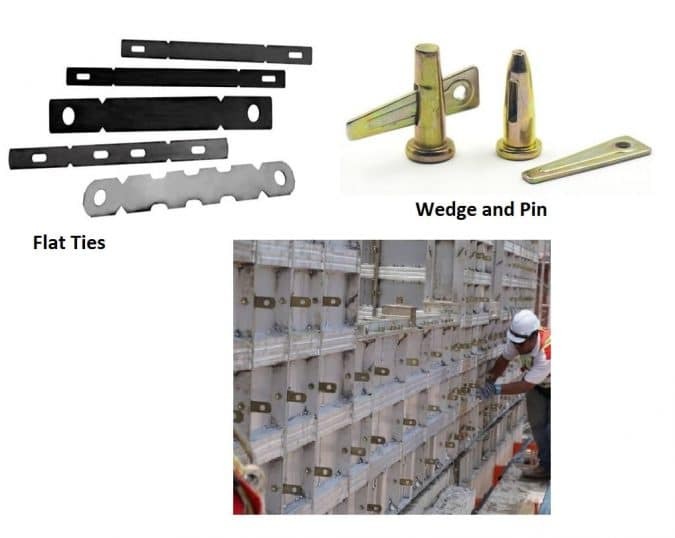 Which of the following tie can be completely removable from hardened concrete? Which one of the following takes higher load ?